I’m lucky enough to live four blocks away from two of my closest friends. We try to see each other as much as possible, whether it’s to walk in Central Park, try a new restaurant, attend book club, celebrate a birthday, or binge watch House of Cards. We went to their apartment last weekend to watch the Oscars and knowing they were planning to host upwards of ten people, I asked what I could bring. They protested and told me not to be silly, so I threw together a big batch of this Almond-Pistachio Granola and brought it anyway. The Nutty Maple Cinnamon Granola I made last year remains my favorite, but I had all of these ingredients on hand the time to let it get all golden and good while I caught up on Dallas Buyer’s Club before the awards. If you’re stuck inside for the umpteenth freezing day in a row this weekend and want to taunt your neighbors with the smell of roasting oats and nuts, throw this in the oven on low and be the envy of your entire neighborhood. Preheat the oven to 250 degrees. Lightly spray two edged, glass dishes with cooking spray and set aside. In a large bowl, mix oats, almonds, pistachios, pecans, coconut, olive oil, maple syrup, brown sugar, and vanilla extract until ingredients glisten from the oil. Add flax seeds, sesame seeds, ground cinnamon, and salt, toss until fully combined. 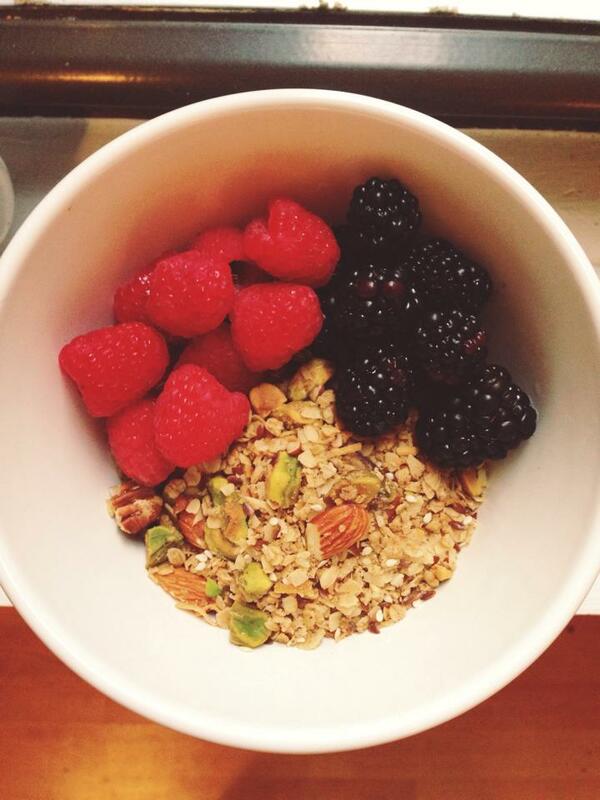 Divide granola between the two dishes and spread evenly. Bake at 250 degrees for 1.5-2 hours, tossing every 20-30 minutes until granola is deeply golden and you can smell it from a mile away. Let cool completely on cooling rack or top of stove before enjoying. Use for party favors, make for a host gift, eat for weekday breakfasts, or have handy for hangover snacks.